Favorite Position: Inside blocker, guarding that line! I’m just happy to be on the track and not on the floor or in the penalty box. At each practice, I look to my teammates for support and advice, and they help me improve my skills and better understand the nuances of the game. I’m part of the “Derby Over 40” club, and — while I’m not the biggest or fastest skater — I’m starting to develop my own personal style of blocking and jamming, and utilizing my unique strengths of patience and persistence. Significance of Name/Number: I chose the name Bliss ‘n’ Vinegar because, although I’m naturally mild mannered, I can get pretty sour and salty when pushed, and it’s a fun play on words — also impossible to say without sounding like you’re cursing. 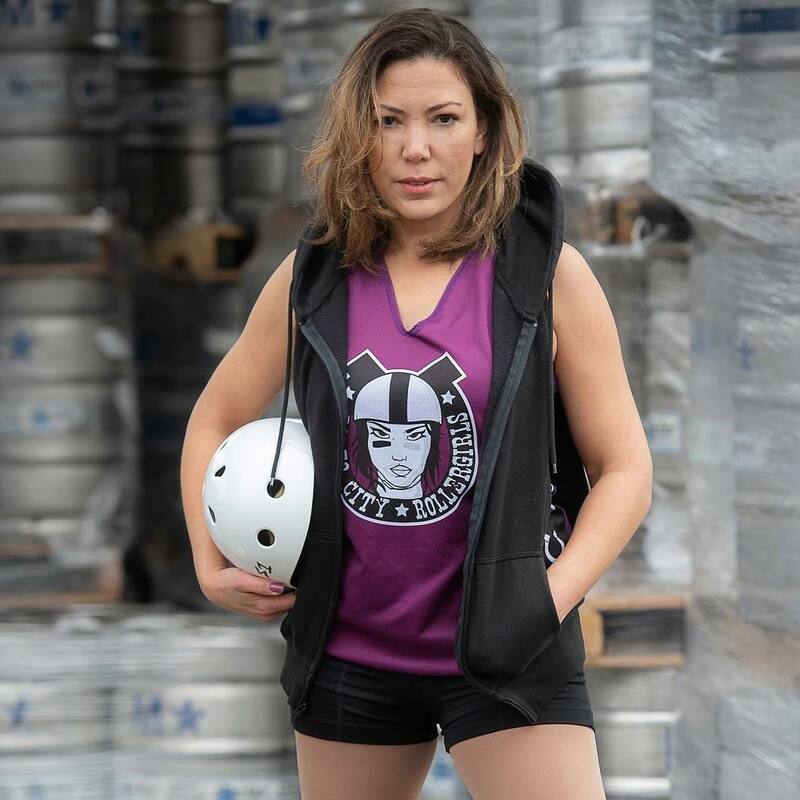 My number (51) is the age that I started playing roller derby. Occupation: Administrative Assistant for a local government agency. Relationship status and family life: I’m currently engaged to a wonderful man, I’m a mom to two fur babies (cats), and having the time of my life as part of this amazing derby community! Major Injuries: I’m currently rehabbing tendon injuries to both shoulders that I sustained as the result of a forward fall during my first month skating, and I have chronic knee pain from an old skiing accident. This year, my focus is on strength training, healing, and staying injury free. I look forward to giving my best to my team. Your first day in roller derby: September 21, 2017 — I’m currently in my second season. I was immediately drawn to roller derby when I watched the skaters roll by me in a parade. I knew nothing about playing the game, but wanted to be part of a group that was so diverse, strong, supportive, and dedicated. Bio: Education and Career—I studied Art and Interior Design and worked 10 years as an architectural drafter. I am now studying to become a Geographic Information Systems GIS Analyst. A Big City Girl with Small Town Roots—I’m a California Girl! West Coast all my life. Hobbies and Interests—Roller derby, circus arts, and mud runs—I enjoy defying my age!